At Springboard, we have the privilege of working with many different types of businesses involved in retail. We enjoy learning from each of them – whether a specialty boutique, a pop-up store, a supplier or wholesaler. We thought it would be great to capture insights from the best of the experienced executives, store owners and staff working in these innovative companies, and so we've started a new interview series: Influential Retail Insights. We'll be sitting down for Q&A sessions with a variety of folks working in or with the retail industry – from customers to friends, colleagues to innovators. If you know someone we should feature, please let us know! We welcome submissions at: IRI [at] Springboard [dot com]. Today, we kick off our series with a Springboard customer, Dobbs senior executive, Andree Fontaine. Dobbs is a jewelry wholesaler and importer of high quality sterling silver, selling to well known jewelry stores throughout the world. Since 1987, Dobbs has been known for its classic and elegant designs. Dobbs timeless jewelry designs range from simple everyday pieces to bold fashion forward styles. Most pieces are designed and crafted in Europe with the classic beauty of sterling silver, brilliantly accented in necklaces, bracelets, earrings, crosses, lockets and cuff links. Headquartered in Boston, Dobbs has established, valued relationships with many of the finest jewelry designers, manufacturers and retailers across the globe. Dobbs needed a solution to better find and use the valuable data in their organization. After an extensive search for the right partner, they found that Springboard was the best fit to help them improve real-time business decision-making. We dig in with senior executive, Andree, to find out why. SB: What were the pain points you were experiencing that enticed you to look at a retail management platform, especially as a non-retailer? Dobbs: I run my business based on data, and I was finding it difficult to retrieve the right kind of data and reports that gave me the information I needed to best run my business. Springboard is flexible enough to apply to a non-retail environment like ours, and still powerful enough to give us real time data, in a super easy to use and incredibly flexible format that makes running our business so much easier and more profitable. SB: How did you go about the process of choosing Springboard? Dobbs: We looked at many different types of vendors and options: Lightspeed, Erply, Vend, QuickBooks. We also looked at Fishbowl and others geared toward the jewelry business, and even considered ERP systems. None of them had all the right ingredients to help with what we needed – they either couldn’t meet our requirements, weren’t responsive to us (which showed us they wouldn’t treat us well during the engagement), or offered canned reports which forced us to work differently, rather than enabling us to customize reports to the way we work. Springboard was responsive, and from the beginning, customer service was outstanding. 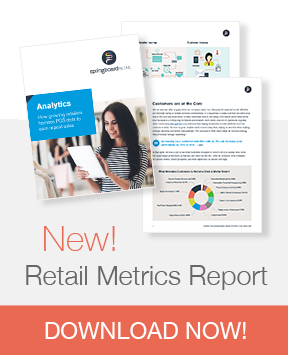 In addition, Springboard was the only comprehensive retail management platform that was super easy to use, worked across multiple locations, offered custom reporting and integration with our existing systems like QuickBooks, and gave me real time data, accessible from anywhere on any device, that allows me to run my business in real time from anywhere. That’s so important for someone in my line of work. SB: How has Springboard helped Dobbs to-date? Dobbs: First, we can use it to develop and share our business processes and best practices, and the platform supports us however we need - rather than having to build our processes around the software. Secondly, it enables our sales people in the field to sell at a much more sophisticated/consultative level because we have the real time data to guide us. We know what each customer has bought and what they haven’t, for example, making orders easy and allowing us to deliver to our customers more quickly. It allows us to provide our customers with the service they deserve, increasing profits and customer loyalty. SB: What departments in your organization are benefiting from the use of Springboard? Dobbs: It touches every department in the organization. Sales people can see what customers have bought; purchasing can see vendors, top sellers, new/old orders, and history; and all of us can see our existing inventory, turns and so much more across all locations, which allows us to carry less inventory – focusing only on what our customers want and need - and run our business more profitably. SB: What has the biggest advantage been to using Springboard? Dobbs: It has improved my gross margins significantly, I wouldn’t trade it for the world. Thanks for sharing how Springboard has helped Dobbs, Andree. If you'd like to learn more about how we can help increase your business margins, visit us, here.